What It’s About: Wolf Frankenstein (Basil Rathbone) returns to his native Frankenstein from England with his wife Elsa and son Peter (Donnie Dunagan) in tow. The locals, however, are not happy with this turn of events, and, superstitious lot that they are, already blame Frankenstein’s monster (Boris Karloff) and his “curse” for nearly everything. Ygor (Bela Lugosi), meanwhile, lives in the ruins of Frankenstein’s lab, using the crippled but not dead monster for revenge. Ygor begins convincing the all-too-ready-to-overlook-Ygor’s-lies Wolf to take up his fathers work to restore the monster to full power, while Inspector Krogh (Lionel Atwill), himself mutilated by the monster as a child, sniffs around trying to figure out exactly what’s going on at the Frankenstein mansion…. Why Watch it Today? : Mary Shelley’s groundbreaking sci-fi/gothic horror novel Frankenstein was published today in 1818, inspiring countless adaptations on stage, radio, screen and television, as well as countless rip-offs. 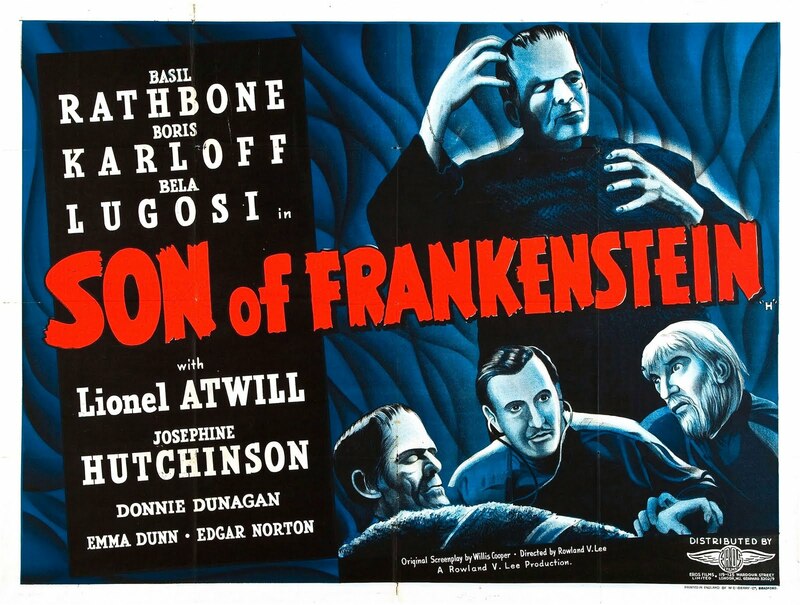 While today’s film (and it’s progenitors) bear little resemblance to their source material, Son of Frankenstein is easily my favorite of the Universal Frankenstein films, with a great performance from Lugosi as the devious Ygor, a better actor in the scientist role in Basil Rathbone, wonderful sets and some genuinely tense scenes. The film was so mercilessly parodied by Mel Brooks in Young Frankenstein, however, that you may have some trouble taking Lionel Atwill very seriously. This entry was posted in Black and White, Horror, Mad Scientist, Monster, Movie of the Day, Revenge, Sci-Fi, Sequel and tagged annoying children, Basil Rathbone, Bela Lugosi, Boris Karloff, cash-in, Expressionism, Frankenstein, Frankenstein's Monster, grave robbing, hunchback, insanity, laboratory, Lionel Atwill, mad scientist, revenge, scientists, Universal Pictures, Wyllis Cooper. Ha. I always try to get friends who’ve yet to see Young Frankenstein to watch those Universal flicks BEFORE they see Mel’s excellent skewering. Otherwise, it’s all laughs in the wrong places! I took a lot of people telling me how good this movie was for me to give it a second chance. I remember seeing it as a kid, post Young Frankenstein and not being able to handle the darts scene at all…just seemed too goofy.